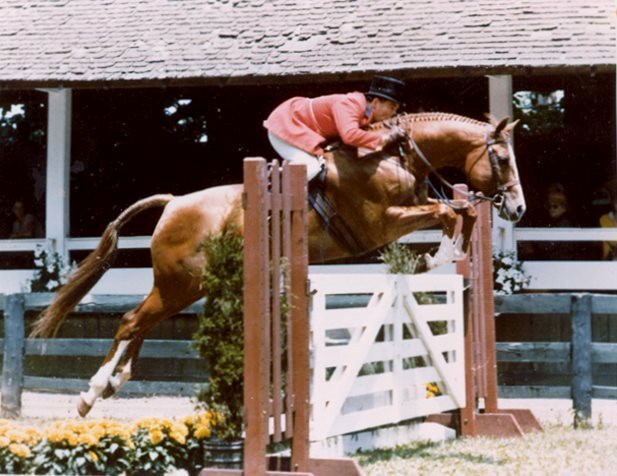 Sir Thomson Ridden by Dave Kelley at Upperville in the mid 1970s. The Rowan brothers’ showman led out a big chestnut colt with four white stockings and a blaze. Delmar shook his head no. He didn’t like horses with four white legs. When the colt was stood-up, Delmar, like Diana and Stanley, saw a very correct horse with a beautiful head, short back, and the shoulder of an athlete. The son of Tompion (by Tom Fool), out of Lady Good Bye (by Bimelech), had the look of a champion. Even though the colt hadn’t had his feet trimmed before coming to the sale, when they saw him walk with his long stride and each leg pointing straight ahead, they knew he was the horse for Diana to buy. 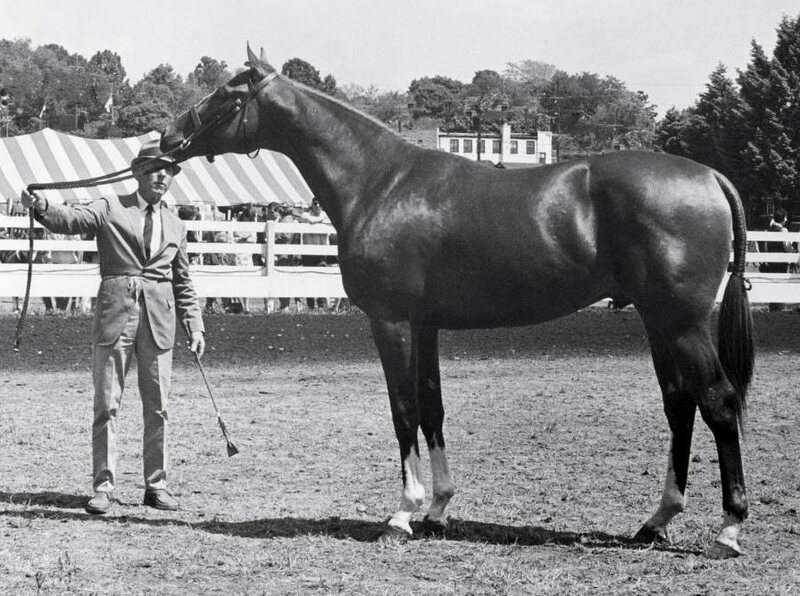 Diana told Delmar and Stanley to not bid more than $5,000 for the colt, but when the bidding hit $5,100, Delmar raised his hand one more time for $5,200. The auctioneer’s gavel struck three times – “Going, going…sold for $5,200!” Diana Dodge was now the owner of a beautiful chestnut yearling colt to ship back to Delmar’s farm in Montpelier Station, Virginia (next door to Orange). 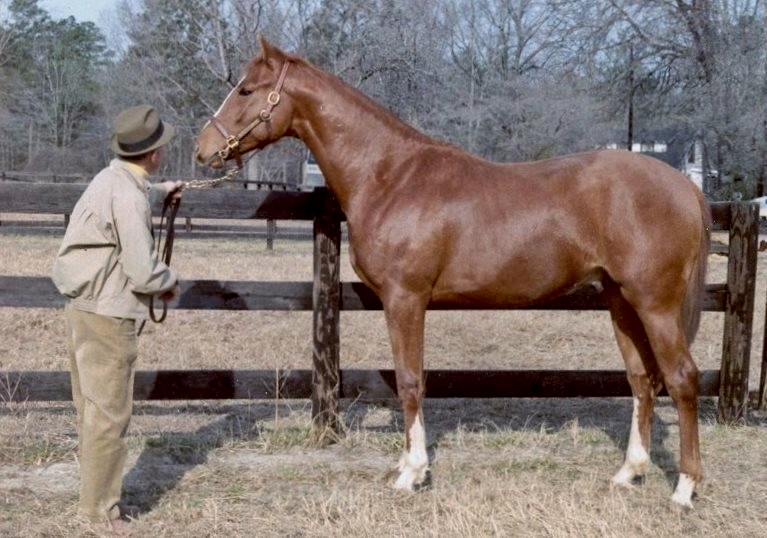 Delmar Twyman standing Sir Thomson at his farm after Tom’s arrival from Kentucky as a yearling in 1969. There were other top show professionals at Keeneland that day, but none of them wanted the chestnut colt with four white stockings and untrimmed feet. Diana named the colt Sir Thomson (no “p”), in honor of her grandmother, whose maiden name had been Thomson before she married one of the Dodge brothers (of the car company). “Tom” was what everyone called the colt. Sir Thomson at Devon in 1970, with Delmar Twyman holding, when he was Best Young Horse. Special he was. Eight months after Diana had bought him at the Keeneland sale, Delmar showed Tom at Devon. 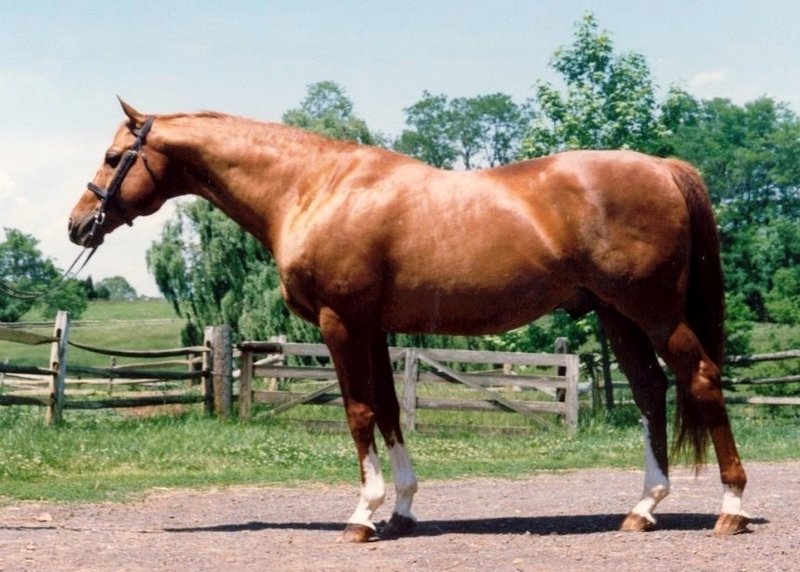 He won the Thoroughbred Two-Year-Old Colt class and was named Best Young Horse over many favorites. Noel Twyman (Delmar’s son) broke Tom that Summer. When Diana shipped her horses to Southern Pines for the Winter, Sunny Pierson helped put a foundation on him. By now, Sir Thomson was 16.1 so Diana decided to wait until he was four to bring him out at the A shows in Green Conformation. 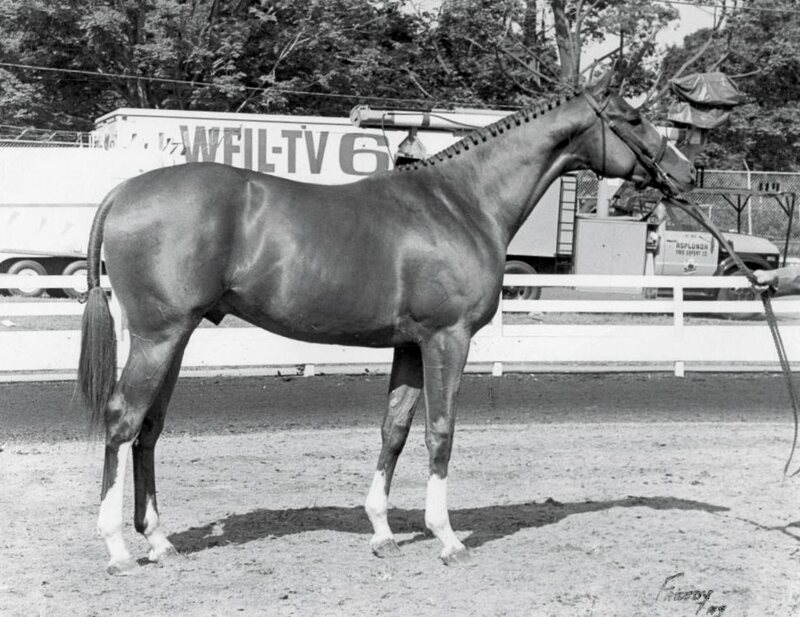 With Noel Twyman riding, Sir Thomson was Green Conformation year-end champion of the VHSA plus he was Champion or Reserve at Harrisburg, Washington, and New York in 1972 as a 1st Year horse. 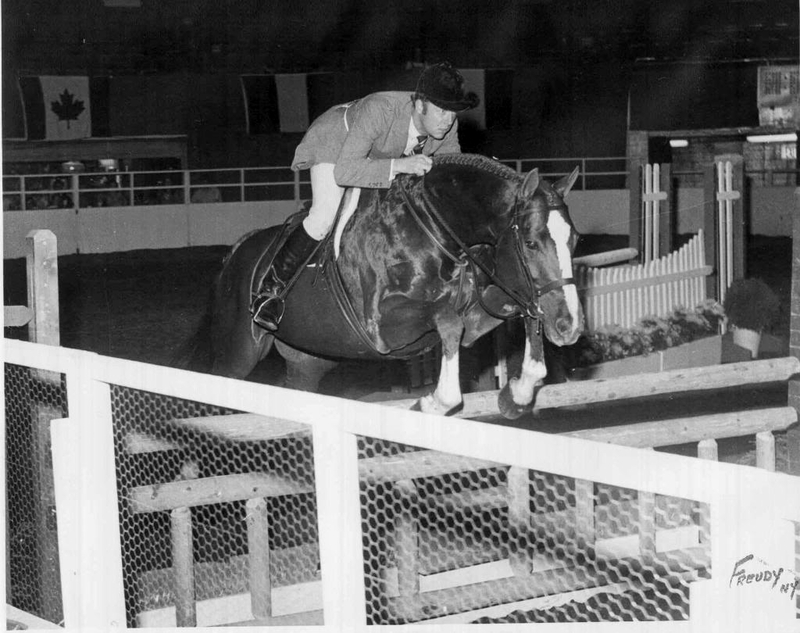 Sir Thomson, with Noel Twyman riding, at The National Horse Show in 1972. Sir Thomson with Noel Twyman during winning class presentation at Washington International in 1972. Sir Thomson, with Noel Twyman riding, at Washington International in 1972. As a 5-year-old, Tom showed at one show and then got hurt. He was out the rest of the year and used up his 2nd Year Green year. In 1974, Diana got Dave Kelley to start showing her now 6-year-old stallion. By then, Diana was breeding Tom so he lived with Dave during the parts of the year that weren’t breeding season and he lived with Diana at her Nokomis Farm in Montpelier Station during breeding season. Tom would breed a mare in the morning, ship to the show in Diana’s trailer, show in his classes, get back on the trailer, ship home, breed a mare in the evening, and then do it all over again the next day. Rodney Jenkins teased Diana by saying that she had a natural tranquilizer for Sir Thomson by breeding him twice a day during a show. Dave Kelley modeling Sir Thomson at Keswick in 1974. 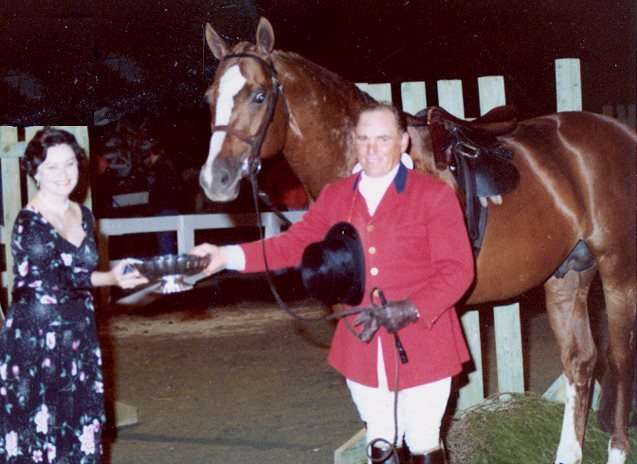 Sir Thomson, with Dave Kelley riding, at Virginia State Horse Show, in 1976. Sir Thomson with Dave Kelley during the winning class presentation at the Royal Winter Fair. 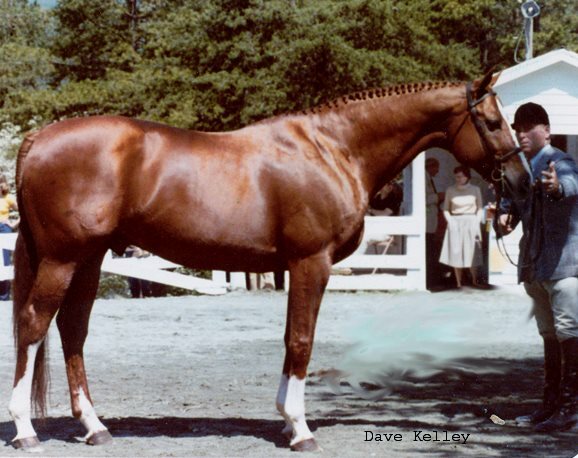 During the four years that Dave Kelley showed Tom, they were champion or reserve at Upperville, Warrenton, Pennsylvania National (Harrisburg), Washington International, the National Horse Show (New York), and the Royal Winter Fair (Toronto) at one time or another. He never showed at Devon as a performance horse because it was during breeding season and too far to trailer back and forth. 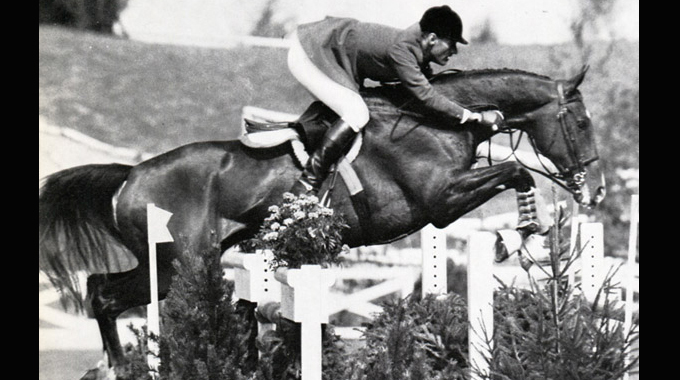 When his show career was finished, Sir Thomson served double-duty at Diana’s Nokomis Farm. Not only was he breeding a full book of 50 mares every year, but he was Diana’s riding horse as she rode out through the trails with Mary Lou Yates riding the young horses. Tom was also a pet. Diana said that he loved to be scratched and would lift his hind leg like a dog when she scratched him. Sir Thomson’s stallion ad picture in the mid-80s. 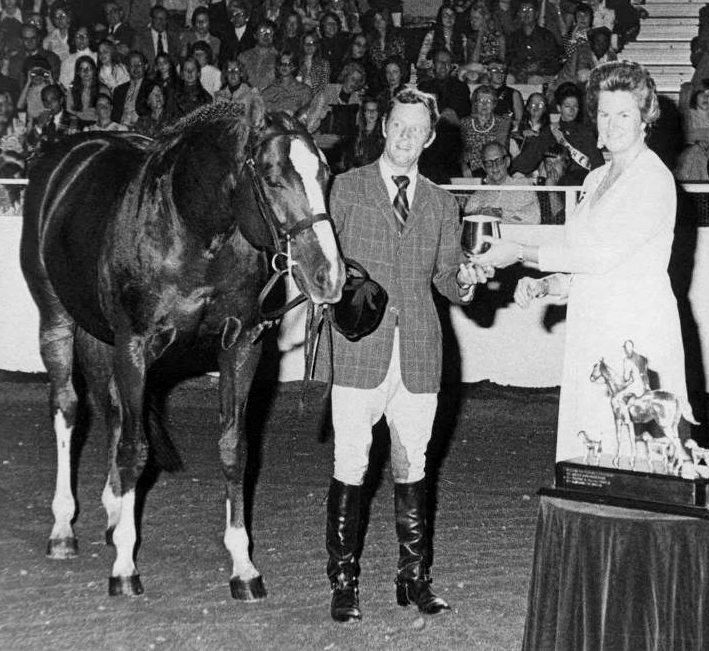 Sir Thomson sired more winners of International Hunter Futurity classes than any other stallion. They also won more than their fair share at all of the major breeding shows. 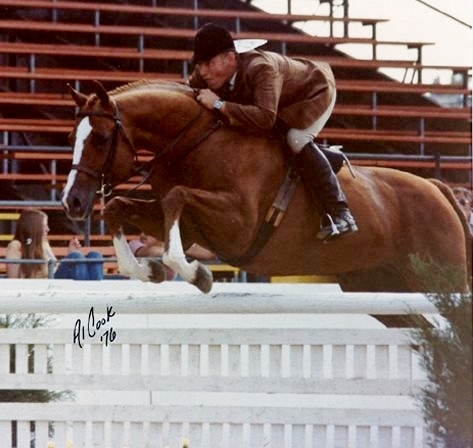 Oliver Brown, who showed many young horses by Tom in breeding classes, said that Banking Business (out of Royal Reveler’s full sister Balance The Books) was one of the “top 2 or 3” best horses that he ever showed. Inning, by Sir Thomson, out of Hitting Home, was from Tom’s first crop of foals and was only 15.0 hands, but she was the favorite “child” of everyone at Nokomis. She was VHSA Yearling Year-End Champion and then went on to be a successful show hunter. 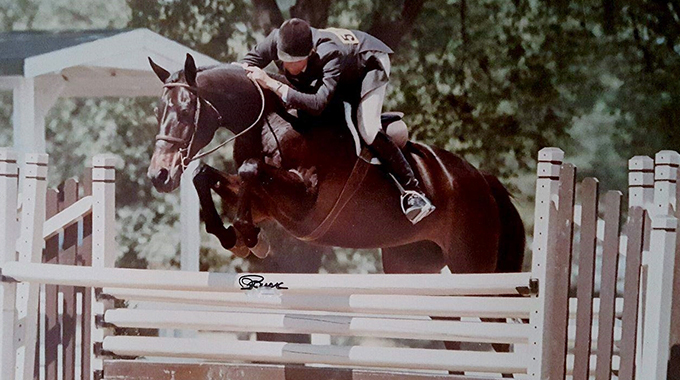 Brian Lenehan showed her in The Founder’s Cup at Upperville and won it. 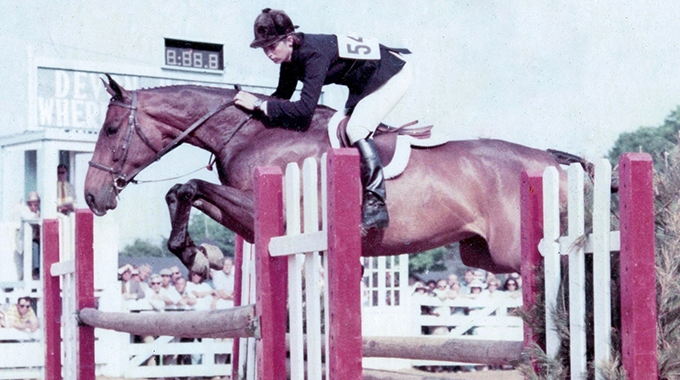 After that, Martha Sifton showed her for a couple of years and won a lot in the Small Hunter division (jumping 3’6”). She was sold several times in her career but by happenstance, after being out West, she ended up at a farm near Nokomis at the age of 20 and Diana happened to see her. Inning then lived out her years at Nokomis. 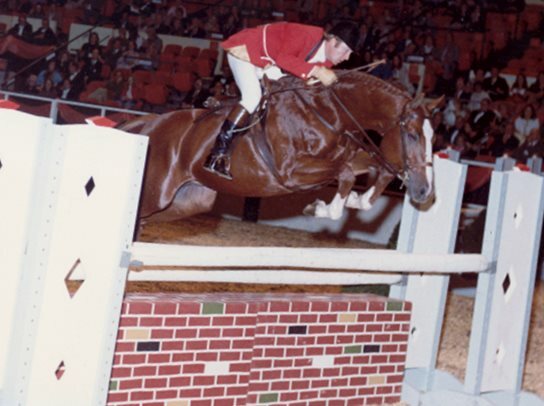 Besides siring top hunters and in-hand horses, Sir Thomson also sired Northern Lights, who showed dressage up through the Grand Prix level with Jules Nissen riding. Sir Thomson started showing slow progressive nerve problems in his hind-end in 1992. On Friday, February 1, 1993, as Diana and Mary Lou stood at his paddock fence, Tom came over to see them. He had little use of his hind-end. They both petted and scratched him, but they both knew that the time had come to have Tom’s pain end. Mary Lou said, “It was as if he came to say goodbye to us.” Tom was put down that afternoon in his paddock and was buried there. Again, another absolutely lovely thoroughbred, history, pictures, and article brought to life again by Marianne. Thank you. Thank you, Lynn. I’m glad that you enjoyed my article on Sir Thomson.